The Ministry of HRD and the University Grants Commission invites applications for Ishan Uday Scholarship For North Eastern Region for the year 2018-19. Selection for Ishaan Uday scheme for AY 2017-18 has not been declared yet. Students with domicile of NER, whose parental annual income does not exceed Rs.4.5 lakh per annum from all sources. 1. Passed XII or equivalent in the preceding year of study i.e. 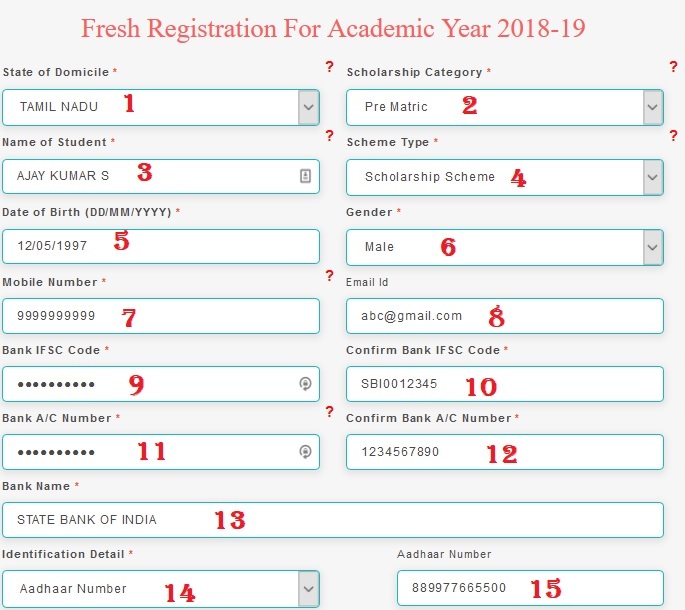 2018 for applications called for during year 2018-19. ** Universities/Institutions/Colleges included under Section 2(f) and 12 (B) of UGC Act. ** Deemed to be Universities included under Section 3 of the UGC Act, 1956 and eligible to receive grants-in-aid from UGC. ** Universities/Institutions/Colleges funded by Central / State Government. ** The admission should have been made in University/ Institution/ College with AISHE code. 3. For availing scholarship under this scheme, the income of the parents of the student should not exceed Rs.4.5 lakh per annum. 4. Transgender candidates are eligible to apply under the scheme. 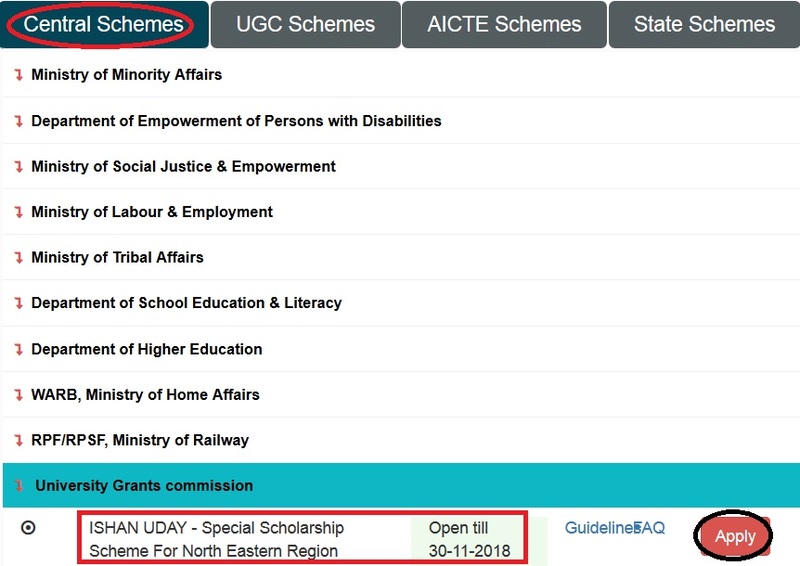 Step 2 : Then Select Central Schemes tab and Click on University Grants Commission in the drop down list. Step 3 : After that Click Apply link in the “Ishan Uday Scholarship For North Eastern Region”. 1. Domicile certificate to be issued by the competent authority. 2. Proof of annual income to be issued by the competent authority. Rs.5400/- per month for general degree course and Rs.7800/- per month for technical/medical/professional/paramedical courses. ** 10,000 (ten thousand) fresh scholarships will be awarded every year. ** Distribution of slots amongst the states of NER will be done on the basis of population census(last). ** If slots in a particular state remain vacant due to non-availability of eligible candidates, the unfilled slots will be distributed equitably amongst other states. ** Reservation for Persons with Disability (PwD) will be made as per Government of India norms. Last date to submit your applications for Ishan Uday Scholarship For North Eastern Region is 30th November 2018. Kindly reply, when will be the merit list of 2017-18 declared? When will the ishan uday scholarship result declared for 2017 – 18 students?